Lady's Fingers, (more commonly called okra in the United States) is a popular vegetable all over India. This is known as Bhindi in Hindi. 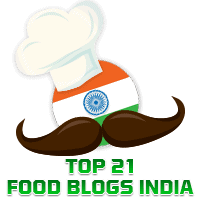 Elsewhere in this blog, you will find lady's fingers recipes such as Bhindi Sambhariya from Gujarat, Bhenda Sagle made by us Konkanis from Karnataka, and Bhindi Masala done in the Punjabi style. 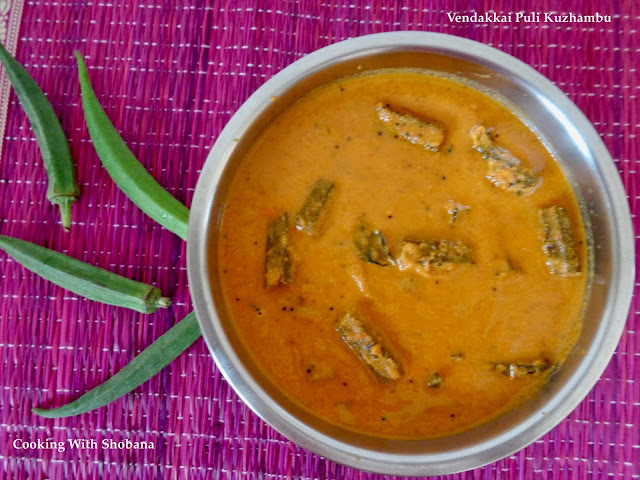 Today's recipe is from the South Indian state of Tamilnadu and is called Vendakkai Puli Kuzhambu after the main ingredients, Lady's Fingers ( "Vendakkai" in Tamil) and Tamarind (" Puli " in Tamil.) This recipe has been adapted from Vendakkai Puli Kulambu in the popular blog, Rak's Kitchen. For best results, in making this dish please make sure the lady's fingers used are tender. We use small onions which are popularly called "sambar onions." Although the original recipe calls for the use of sesame oil, I have used regular cooking oil. Peel the small onions, roughly chop the tomatoes and slice the garlic pods. Keep aside. Add another 1/2 cup of water and extract the tamarind juice. Keep aside. Heat 1 tbsp of oil in a thick-bottomed kadhai and when it gets hot add the lady's fingers and shallow fry them on medium flame, stirring from time to time till they lose their stickiness and get cooked. Keep aside.